​Hanging your stockings by the fire (with care) is a Christmas tradition we always love. It adds such a warm, cozy feeling to a living room or den, and really ushers in the holiday vibes. But what if you don't have a hearth to hang them from? And what if the traditional red, white and green stockings don't really match your vision for holiday decor? There are a lot of fun and creative ways you can decorate around your home with stockings—and ways that you can incorporate them with your everyday decor for a streamlined, sophisticated look during the holidays. We found 10 beautiful and inspired ways to display your holiday stockings this year, from DIY displays to traditional mantels complete with a roaring fire. 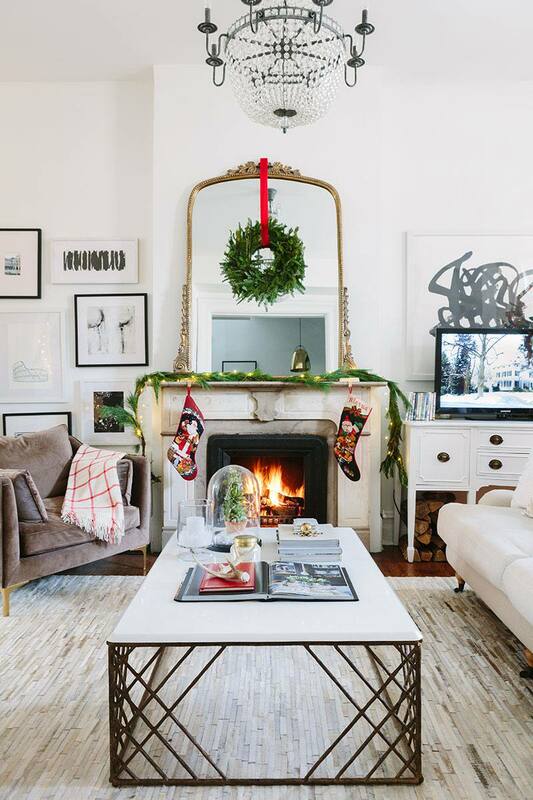 What makes this mantle display so charming and appealing is the way Alaina Kaczmarski, the homeowner, has mixed modern and traditional design elements in this holiday home tour for The Everygirl. Her holiday decor—from the greenery to the stockings—is rather old school. In contrast, her artwork and furniture feel bright and contemporary. There's something so welcoming and nostalgic about letting rich evergreen holiday greenery speak for itself, adorned only with festive white lights and a big red ribbon. And on that note, we can't get over how much we love the extremely nostalgia-inducing needlework stockings, complete with those sweet stitched Santas and presents. If you have a grand fireplace and traditional mantle, scaling back your decorations to just a few sprigs of greenery and a couple of stockings can be the perfect balance—it won't overpower the already eye-catching presence of your roaring fire, but will add a nice dose of warmth and homey energy for the holidays. And if you don't have an actual mantle... Make one! We count those who have actual fireplaces in their home or apartments super lucky, so don't fret if you've gotta work with what you have—even if it's just a blank wall. We love this minimalist and super-creative DIY stocking display from the blog, The Merry Thought. Shannon, the author, took a large found branch, cleaned it up a bit, added some fragrant and festive eucalyptus bundles for a splash of green, and mounted the piece to her wall with temporary hooks. In keeping with the minimalist theme, she adorned her DIY mantel with three monochrome grey stockings. This isn't a traditional holiday color scheme, of course, but if your home already has a lot of colors going on, or if you're just craving holiday decor that doesn't distract too much, this is a great option. This playful and feminine mantel stocking display is from a children's holiday party we found on The Glitter Guide. While the knit stockings themselves—red and white, adorned with Santas and snowflakes—have those classic holiday details, it's the mantel display that really feels fresh and new. She's taken a typical evergreen garland and brightened it up with pink and red roses as well as little springs of baby's breath and eucalyptus. This is a great idea if your home has a more feminine design aesthetic or you always want to keep a bit of springtime cheer around. Here's another great way to display your holiday stockings if you don't have a fireplace or a mantel—hang them on the railing of your stairwell! We found this charming display via The Inspired Room, and can't quite get over how great it looks. With kids, you can arrange the stockings from low to high based on their ages, even! We love how they've mixed up the playful red, white and green holiday stockings with white lights and green garlands. This is a very classic Christmas aesthetic, but by displaying the stockings on the railing of their stairs instead of by the fire, it feels fresh and fun. Leave it to the creative minds at One Kings Lane to make a holiday display feel so incredibly special and yes, slightly over the top! Color is the key with this idea. Look for stockings that break from your traditional holiday colors—with hints of blues, oranges and yellow, and then add small elements that also reflect those colors. You don't have to go nearly as all-out as they did here, but the anti-Christmas colors will really pop against a white background. Try searching places like Anthropologie and Etsy for these non-traditional and crafty decorations that really do put a youthful, cozy spin on holiday decor. And what about those of us who live in tiny apartments where blank walls are hard to come by—and there's no chance of a staircase let alone a fireplace. Stephanie Sterjovskis shared a unique space-saving idea on The Everygirl that we love: create a sweet, monochromatic display on one of your bookshelves. Here we see how a room decorated mostly in shades of white can easily get a little holiday makeover, thanks to light-up letters spelling a festive word like 'jolly' or 'noel' and a couple of off-white stockings. This easy faux-mantel allows you to create a little corner of holiday charm virtually anywhere in your space. If you want to make your holiday stockings a focal point in your holiday decorating, why not hunt down a pair of vintage skis and use them to hang your stockings? This idea we found from Digs Digs uses a set of skinny red alpine skis mounted on the wall as the location of the stocking display. Here, the look feels very farmhouse chic, thanks to the handmade look of the stockings and vintage skis, but you can easily flip this idea on it's head. With a pair of old skis from the 90s or 80s mixed with sort of cheesy, traditional stockings you could channel a whole different look. Will all the creative minimalists please raise their hands? This beautiful display is another one we found via One Kings Lane, uses layers of wildflowers and eucalyptus bundles to create a faux garland infused with touches of purple and white. This is a totally unexpected color combination for the holidays, but totally works with the shimmering little holiday houses and trees, as well as the sophisticated black and white stockings. Anyone who wants an outside-the-box approach to your holiday stocking mantel can find inspiration here. Use bunches of unexpected flowers to make your neutral decorations really pop. Traditional meats minimal in this mantel display idea we found via The Glitter Guide. A dark wood mantel makes an idea backdrop for an unfussy collection of green and white holiday decor punctuated with elements of silver and gold. For anyone who doesn't want their holiday decor to overpower a room, this is a great idea. Simple, sophisticated white or off-white stockings will stand out on their own against anything other that white, and you really can't go wrong any time of year with hints of metallic. We love how Shannon of Home Made Lovely used her mantel area as the staging area for her stockings, but instead of hanging them over the fireplace, simply leaned a rustic ladder against the wall and hung the (homemade!) stockings on the rungs. This look is definitely unexpected, but great if crave something a little different.